I'm not sure that there's too much to say about this one. Normally I'm against Stephen Harper because I think he's a racist and I would not be surprised if his opinion that veiled voting should not be allowed is his opportunity to attack Muslims since the majority of veiled women are Muslims to the best of my knowledge. What's worse is that we'll see increased hate against Muslims, the hate groups will again use this against Muslims and try to spread more hate and propaganda. The reality is as Elections Canada says that we're talking about a few hundred women across Canada at most and most of them have agreed to show their faces if requested. But an important point to me is that everyone should be required to show their faces and you shouldn't be allowed to mail in your vote. Hiding your face is a security risk in my opinion and as the Qur'an says we should obey the laws of our country. The Qur'an also does not state that a woman must at all times cover her face in the first place so I don't see the problem here. Veiled women will not have to show their faces at polling stations in upcoming elections, but theymay be asked for sworn statements in some situations to verify their identities, Canada's chief electoral officer said Monday. Marc Mayrand also challenged politicians who havevoiced their criticism of the policyto change theElectionsActifthey want more stringent identification requirements on election day. Canada's chief electoral officer, Marc Mayrand, speaks to the media on Monday. 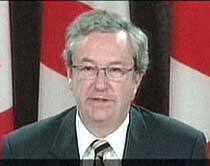 "I invite Parliament to change the act," Mayrand told reporters Mondayat a press conference in Ottawa. "It's not for the administrator to settle the current societal debate. If I were to do so, I would assume the role that does not belong to me, and above all, usurp the role of Canada's elected politicians." Mayrand'scomments come a day after Prime Minister Stephen Harper accused Elections Canadaof subverting the will of Parliament by permitting Muslim women to wear niqabs or burkas while voting. "I profoundly disagree with the decision," Harper said Sunday, adding that it was at odds with federal legislation passed in late June. Mayrand said the act does not contain an absolute visual recognition requirement, noting that about 80,000 voters cast their ballots by mail in the last federal election. Veiled voters who only present one piece of governmentphoto ID — the most basicstandard of voter identification — at polling stations will be asked, but not required, to show their face, he said. "I have asked election personnel to invite anyone whose face is concealed to uncover it in a manner that is respectful to their beliefs," Maynard said. If they decline to do so, he said, the votersmustchoose one of two other means of identifying themselves,neither of which requires photo identification, as stated in the Canada Elections Act.In those cases, the actallowsvoters either to present two pieces of approved ID, at least one of whichmust state their address (but neither of which must contain a photo), or tohave another voter registered in the same district vouch for them. "I have not amended the act to require them to uncover their face," he said. "The choice remains up to the individual." Harper said all four parties in the Commons voted "virtually unanimously" this spring to bring in a new law requiring visual identification of voters. But Mayrand said the act was clear and it was not within his mandate to make any changes. Despite the flurry of controversy surrounding the issue, Mayrand said only a few hundred women in Canada wear full face-covering veils, and most have indicated a willingness to show their faces under proper circumstances. He added that no Canadian Muslim has requested any specific treatment with regard to voting. Debate over the new voting provisions, announced last week, comes amid preparations for three federal byelections to be held in Quebec on Sept. 17. Reacting to Mayrand's comments, Bloc Québécois MP Michel Guimond said: "In the case of a niqab or burka during the federal byelection that'll take place Sept. 17, the[chief electoral officer]has made the identification of electors impossible." Guimond said Mayrand's decision "does not take into account the reality of Quebec society," reminding the public of the controversy that took place during the last general election in Quebec. In March, Quebec's chief returning officer, Marcel Blanchet,had tohire bodyguards, and Elections Quebec received threatening phone calls, after he decideditwas acceptable for Muslim womento keep their faces covered at the polls.That decision was later reversed, requiring women to show their faceswhen they voted. Guimond said his party will push for an amendment the Elections Act. NDP Leader Jack Layton said he continues to hold out hope that Mayrand will change his position before the byelections, but is prepared to support a legislative move. "If not, it appears it will be necessary to change the law to make it clear," Layton said. But Liberal Leader Stéphane Dionsaid that he would respectElections Canada's position, even though he disagreed with it.